Honored & Humbled, this March in Cleveland, Ohio. 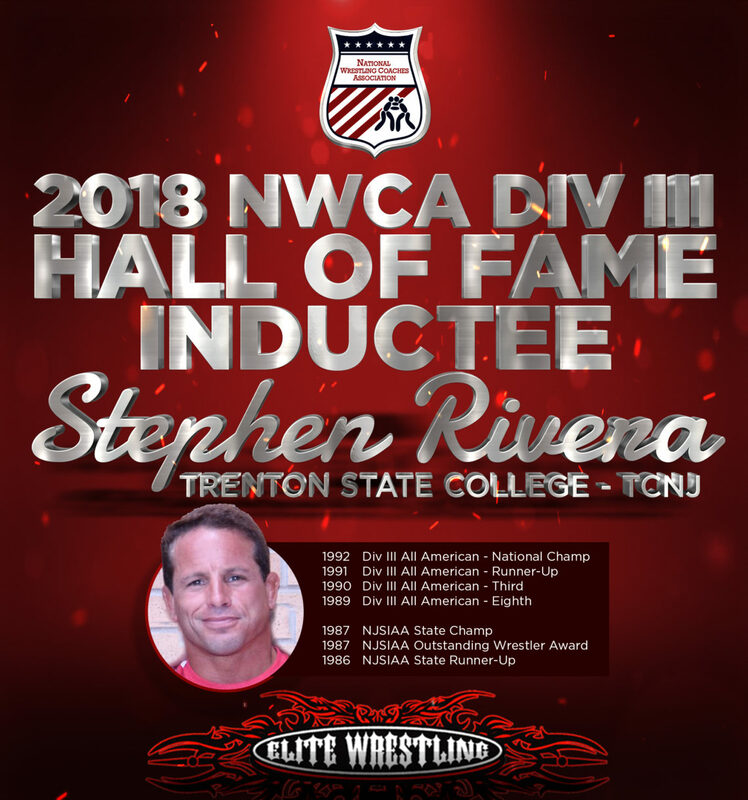 The same location where the NCAA Wrestling Championships will be hosted, Elite Wrestling’s Stephen Rivera will be inducted into the National Wrestling Coaches Association (NWCA) DIII Hall of Fame. It is a great honor bestowed onto a lifelong journey that continues 42 years after it started. A product of the Manalapan Mat Rats Recreation Wrestling Program, Steve has been on the mats competing, training and coaching for 42 years. In 2016 he lived his most memorable wrestling moment, watching his son win a NJ State Championship. It’s these types of wrestling events that dynamically fall into place as his journey continues. At age 5, Steve joined the Manalapan Mat Rats recreation program while attending St Thomas the Apostle on RT18. Jack Finley and Dan Quintiliani were the coaches. He joined his older brother Randy who was already a wrestler and then eventually their younger brother Rick followed. His father, Warner was a long-time volunteer coach for football and wrestling in town who spent many days and hours supporting the youth of the town and neighborhood. In 7th grade Rivera transferred from St Thomas Private to Pine Brook Public school to further pursue education and his wrestling interests. It’s there were he wrestled under Larry Tave, Art Arbeitman and has USAW-NJ experience with Warren Reid and pre-high school experience under Denny D’Andrea. It is during these years we start to see what the future could possibly have in store for Steve’s wrestling journey. Making the most of these coach/mentors he progressed through the middle school competition with great success. In addition to the standard season competition and league tournaments, in 1982 he experiences his first high level success placing 4th at AAU Junior Olympics in Northern Iowa. It was that milestone that set light to a fire that still burns strong today as he does all he can to give back to the great sport of wrestling. In High School, coached by William Terrell and Arnie Liftland, Steve ‘finished as Team Captain, two District 21 Championships (’86, ’87), a two-time Region 6 finalist, Steve was able to capture his Region 6 Championship in ’87, a two-time NJSIAA State Finalist, Steve was able to capture his NJSIAA State Championship in ’87 as well as the highly regarded NJSIAA State Tournament “Outstanding Wrestler” Award. After graduating Manalapan High School in 1987, Steve chose The Wolfpack of North Carolina State University to continue his education and wrestling. Bob Guzzo was head coach, assisted by Greg FatuI. Redshirted as a true freshman, Steve returned to New Jersey to compete and study at Trenton State College (TCNJ today) in the fall of ’89. Under the coaching leadership of Dave Icenhower, Tom Isaac and Bob Glaberman, Rivera finished four-time All American, placing 8th ’89, 3rd ’90, 2nd ’91, 1st, ’92 and National Champion. In 1993, after graduating college Rivera accepted to be coaching assistant to Mike DeStefanis at Central Connecticut State University and founded Elite Wrestling (Glastonbury, CT). In 1996 Steve returned to NJ where he continued Elite Wrestling but replaced Joe Melchior as the head coach of the Toms River Wrestling Club (1996-2002) and continued building his Elite Wrestling brand here in NJ. During this TRWC coaching tenure the Jersey Shore Wrestling League was created and became the premiere youth wrestling league in the state of NJ. As coach, Steve won the league his last three years 2000, 2001, 2002. During this same time, Steve was one of the founding members of the non-profit Manalapan Mat Rats to ensure wrestling opportunity for the future youth of Manalapan (2001-2005). Since 1993, Steve has worked hard on building his Elite Wrestling program and today is considered a premier national wrestling clubs. Consistently affiliated with Nationally recognized wrestlers and many of the World’s Top UFC Fighters, Elite Wrestling has made a large impact on many. They have produced State Champions, National Champions and World Champions. Multiple year-round locations Jackson, Toms River, Manalapan, #ElitePowered programs at Robbinsville, West Windsor and The Peddie School. Elite Wrestling is leading the way in building quality student/athletes and aiding parents build men and women on and off the mat. Season 19 vs Team BJ Penn in 2013. Now 2016, Frankie is still one of the top contenders and Team Edgar is busy fighting their way to another title shot. Men & Women it Creates. In 2015, Steve was nominated and confirmed at USA Wrestling -New Jersey Vice President Kids. In his first month on board he floor-hosted the USAW-NJ State Championships in Trenton and in recent months has spearheaded the process to secured an automated tournament software solution for next year’s USAW-NJ State Championship event. State Champions, sharing that special wrestling accomplishment with South Jersey Miller family.